Before I blog about today's card, I want to bring your attention to the following sale over Altenew. 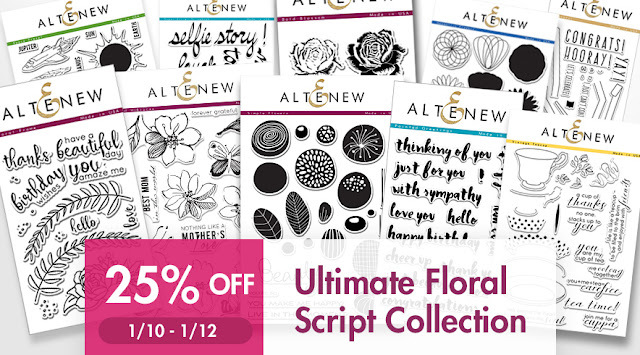 25% OFF Ultimate Floral Script Collection now through Thursday, January 12th at 11:59 pm ET. Not valid on prior purchases. No code needed. NEW: Altenew has alcohol markers now (see here)!! I love this die from Simon Says Stamp so much that I came up with another way of using it. I had made a few versions of it (see here and here). Since it is the new year, I wanted to create something fresh and for all occasion. Hello cards are my favorite kind of cards to send. I started out with stamping the INSIDE of the collage. And with the die, I can "guess-timate" how it look once you place the die over the flowers. I love how this turned out. It looks intricate yet, it is so easy to create! I think the key is to stamp as many colors as you can, so the colors really pop against the collage. I think I used at least 10 colors of inks. what do you think? I hope this card brightens your winery day! here are what's new over Simon Says Stamp. Love the bright colours! Beautiful! Oh, this is certainly bright and fresh! Sooo beautiful, Virginia! Love! A very bright and cherry hello indeed! Love it Virginia. 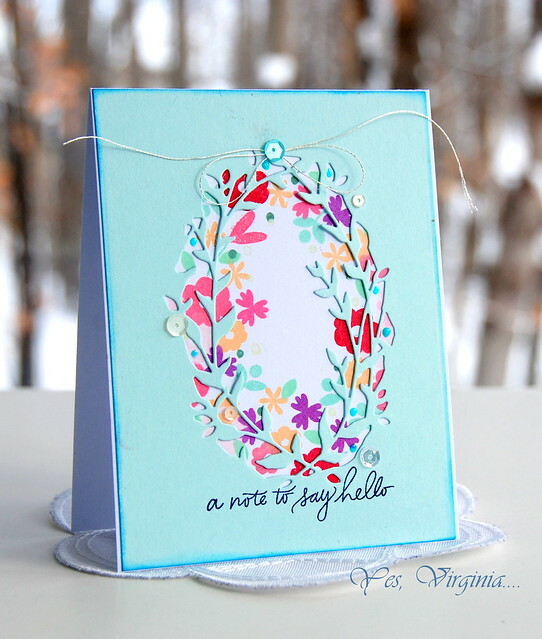 Beautiful idea for our oval dies and small stamps! Thanks, Virginia and love all of the many colors! Lovely. A truly refreshing use of an excellent die. The colorful flowers peeking through makes this card magic. You do have a way with dies Virginia!! This is lovely! 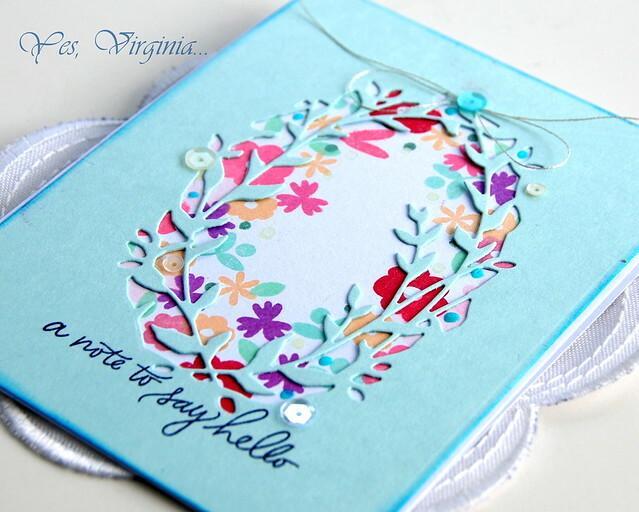 Just love how you added stamping in the window behind the die, Virginia!! Great idea; beautiful card. Love the look and I can see using this technique with other dies. TFS! That is a great use of that die. I love all the bright flowers in the design. So sweet and terrific for these grey, snowy or rainy days. Lifts one's spirits perfectly. This certainly brightens MY day Virginia! Its beautiful! Thank You! OMG - this is so beautiful, Virginia! I love how bright and cheery it is.